Holiday yards can get a little crazy with plastic deer, giant inflatables and cartoon figurines. This year I went all natural and it’s my all-time favorite. 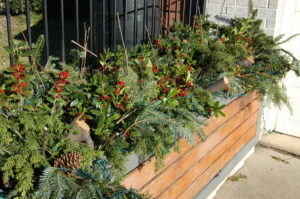 During our trip to Montana for Thanksgiving, we kept running across cool winter styled window boxes. 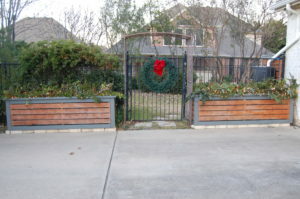 Which gave me the idea, to use my raised garden beds as part of my Christmas yard decor. 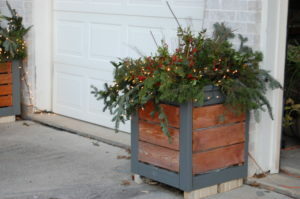 I also tied the style of the raised beds and window box to my front door decor. I am trying to avoid adding any more plastic to my home, so this natural decor was not only economical but good for the environment, too. Everything I used in my raised beds can be composted after the holidays (except the lights). Consider what you have readily available versus buying. I collected juniper branches from around our lake cabin , pine tree boughs from our local home depot(free at the Christmas tree stand), and holly branches cut from my yard. A few months back we did some yard clean up and had saved some of the larger branches for fire wood, which I thought would be good for additional texture in the large boxes. Start by building your base. In the larger raised beds, I started with the large cut pieces of wood. 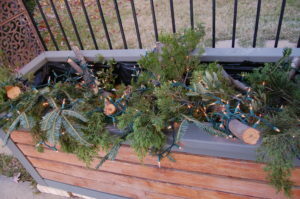 In my window box, which is much smaller, I started with pine boughs. 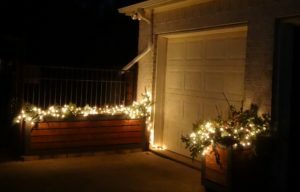 Once you get your logs and greenery arranged, add the lights. I started with regular string lights but moved to the shrub grid type lights because it gave the branches a little more stability and structure. 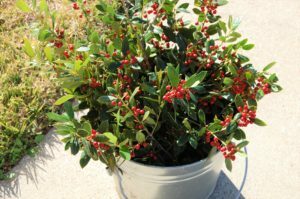 Next add your color, for me this was the holly branches I trimmed from my holly shrubs. They needed trimming and this provided a lot more filler for the beds/boxes. If you don’t have access to anything red, consider adding red ribbon. If you want to keep with the all natural approach, you could add apples or pomegranates for additional color. 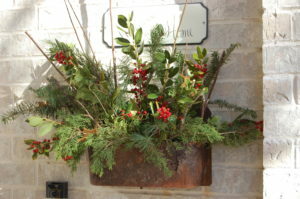 I opted for the holly branches because the fruit would rot quickly in Texas with temps in the 70’s. Next I added pinecones and smaller sticks to add additional texture. 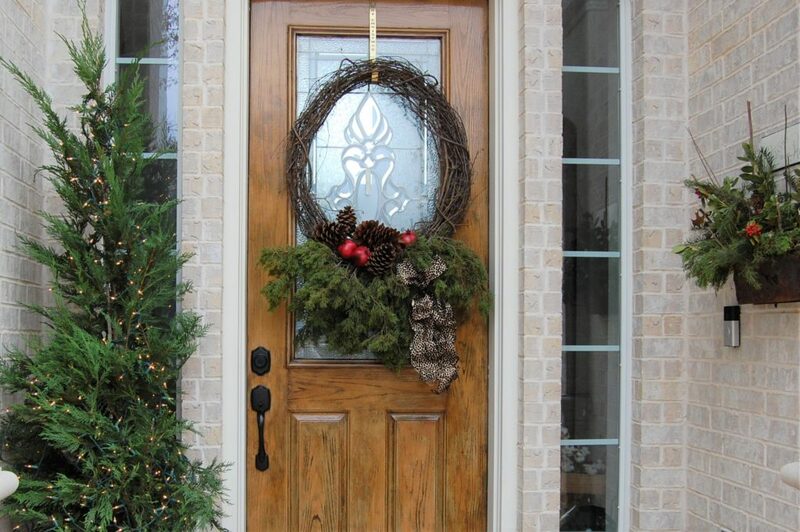 I completed the yard decor with styling my front door wreath with juniper boughs, pine cones and pomegranates. 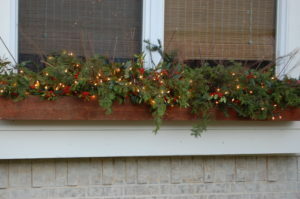 To complete the front porch, I have a wall planter that I filled with the same items as the window box and then added a potted live cypress tree with lights.